It's Friday, January 13th and I'm finally getting back on the road. As you may recall, I recently broke my 24-70mm lens while out shooting in Big Sur. In a freak accident, the wind blew over my tripod effectively breaking my lens in two. After screaming a few obscenities to no one, I took a little bit of comfort in the fact that the lens was insured and should be easily replaceable. However, this lens is by far my most versatile and without it I suddenly felt crippled. Knowing that I couldn't continue on without it, I opted to wait until the insurance was sorted out before continuing on. As luck would have it, both of my sister's live just a few hours south in Los Angeles. A place that, until recently, I had also called home. I naively expected to be there for a few days, fly home for Christmas, and be back on the road by New Year's. However, because all of this happened right before the holidays, things have taken a bit longer than expected and I've now been crashing on my older sister's couch for over three weeks. With all of this extra time, though, came time to see and catch up with lots of old friends. Reuniting with everyone was like stepping back into a former life. I lived in LA for almost five years, pursuing acting that whole time. And while I ultimately walked away from it, my time spent with these people will always be the highlight of my time living there. My next stop is San Diego where I had the lens overnighted to my cousin's house. From there I'll visit Slab City near the Salton Sea and then cross over into Arizona on my way to the Grand Canyon. I can't express enough how thankful I am to my older sister, Taylor, and her husband, Elliot, for letting me crash with them this whole time. In the weeks I've been here, a thought that keeps crossing my mind is how lucky I am. If that lens hadn't broken where it did, this could have ended up being a much more expensive delay. Instead, I had three relaxing weeks spent with family and friends. But now, the road is calling me back and I have many places to see. Here's a photo from Olympic National Park to hold you off till then. I'm in Los Angeles. A place I called home for nearly five years and life couldn't be sweeter. More accurately, I'm at LAX preparing to fly back to Houston to spend Christmas with my family. After battling lots of rain and overcast days in the past month, the pristine SoCal weather feels like an early Christmas present from the road. Post Washington, I made my way south to Portland, Oregon. Coming from Austin, Portland is a town that I was very excited to see. The two are sometimes referred to as sister cities due to the off-beat characters who live there and their attraction for all things "weird." Mostly, though, I was looking forward to seeing my good friend Tierra. Tierra and I met through our acting class in LA and have been good friends ever since. She recently moved back to Portland and when I told her I'd be coming through she insisted that I stay with her and her new puppy, Kairo. Tierra is a native of Portland and having her as a tour guide was great. One thing I didn't know about Portland is how many incredible waterfalls surround the city. Just driving on the outskirts of the city limits you'll find numerous hundred-foot falls just dying to be photographed. I ended up staying in Portland for only two days, but I wish I could have stayed longer. Even with a great tour guide like Tierra, I left feeling like there was so much more to discover about this great city. My amazing friend Tierra - private investigator by day, actress by night (or maybe it's the other way around). A thought occurred to me while I was in Portland that it's entirely possible that deep down inside a big motivation for this trip was my desire to see and shoot the Pacific coast again. So after saying goodbye to Tierra and driving back to the coastline, I decided that I would throw my itinerary out the window and let my camera dictate my schedule for a bit. My first stop was a little area called Cannon Beach, home to the monumental Haystack Rock. The photo I captured doesn't do it justice. This thing was huge! Measuring at 235 feet in height, you might recognize Haystack Rock. Back in 1985, it played a key role in helping a group of ragtag adventurers known as The Goonies find the infamous pirate One-Eyed-Willy's treasure. That night, I slept in my car near Cannon Beach. In order to compensate financially for the extra days in Oregon, I had to get a little creative with places I slept. There aren't many Walmarts near the coast and campgrounds can be expensive (relatively). Most nights, I didn't even know where I'd be sleeping until well after nightfall. Fortunately, there are numerous resources online to aid in this dilemma such as FreeCampsites.net . My homes for the night ended up ranging from discreet side streets, motel parking lots, and even a couple of Native American casinos that allowed overnight parking. It was absolutely unorthodox, even by this trip's standards, but the challenge and uncertainty added a new and welcome level of excitement to the trip. My next big stop was Crater Lake National Park in south central Oregon. Crater Lake formed over 7,500 years ago when a volcano blew its top. In the millenniums since, it has filled with water. At it's deepest, it measures close to 1,950 feet with an average depth of around 1,150 feet making it not only the deepest lake in America, but also one of the cleanest. As I made my way up, the roads slowly turned from concrete to dirt. Soon I began to see snow on the sides of the road and before long I was driving up steep, uphill roads that were completely blanketed in white powder. I'm from Texas. Snow is foreign territory for me. To say I was nervous as I drove to the top of this peak is an understatement. Any moment I expected my tires to give out underneath the slippery terrain beneath me and to feel the pull of gravity send me back down the mountain. Thankfully, that didn't happen and I made it to the top in one piece. Despite the risk, the view from above was well worth it. The deep shades of blue were complimented by the white snow surrounding the water making Crater Lake one of the most incredible places I've ever laid eyes upon. I wanted to stay and shoot Crater Lake much more, but the snow made most of the park inaccessible. If there's one thing I've learned on this trip, it's that weather in the mountainous regions can change in an instant and I'd already encountered plenty of rain the day before. Therefore, I opted not to push my luck and try to shoot it at sunrise or sunset when the temperatures were lower and the risk of ice on the roads increased. In spite of that, I am very happy with the shots I got and if anything I now have a great excuse to visit Oregon again soon. My next stop was an area relatively close by and one that holds a very special place in my heart. In January 2015, after living in Los Angeles for five years, I decided to leave California and move back to Texas. But before I did, I made a weeklong road trip up the Pacific Coast Highway to the Oregon border and back. My most northernmost stop on that trip was a little place called Jedediah Smith Redwood State Park about 20-miles south of Oregon. Jedediah Smith lies in the heart of Redwoods National Park. I discovered it by accident and immediately fell in love with the place. I knew when I set out on my current trip that I had to stay there again. Last time, I was able to get a great shot of the turquoise Smith River that runs alongside the park, but unfortunately, months later I suffered a hard drive crash and lost every photo from that trip. When I arrived this time, I was determined to shoot that same scene again, but heavy rains and two years of vegetation growth prevented me from getting my shot. Regardless, it was a treat being back here. I even stayed at the exact same campsite just a short walk from the river. Redwoods near Jedediah Smith Redwood State Park circa 2015. Had to copy this from my website as the original was lost in the hard drive crash. Taken on the Howland Hill Road. Smith River circa 2015. Had to copy this from my website as the original was lost in the hard drive crash. All in all, I wasn't able to get many shots here due to bad weather, but it was a treat being back. If you can ever make it, you'll be treated to beautiful blue river water and towering redwood trees. I recommend driving down the Howland Hill Road. You won't regret it. The last time I drove down the Pacific Coast Highway I was blessed with pure blue skies and perfect weather every single day. This time around, not so much. As I made my way down the coast towards San Francisco I was flooded with constant rain and overcast skies. A road trip down the PCH is always going to be stunning, but the bad weather made the incredible photos I saw in my head impossible to capture. With no sunshine on the foreseeable horizon, I opted to forego camping at Redwood National Park and simply spend a day driving through it gazing at the enormous trees. After camping in a pull off on the PCH, I made my way to Fort Bragg, home to the famous Sea Glass Beach. Starting in 1906, Fort Bragg established various dump sites along the coast to discard anything from glass to car parts. They remained active until the mid-sixties and the community has since made considerable efforts to clean up the beach. What remains, however, is soft, smooth sea glass produced by decades of ocean erosion. The colorful beads mix in flawlessly with the sand, hence the name: Sea Glass Beach. I arrived in San Francisco later that day and found to my joy a rest stop allowing overnight parking right next to the Golden Gate Bridge. Now, I know, car camping isn't for everyone, but it's hard to argue with a view like this as you fall asleep at night. The weather in San Francisco was rainy and would be for a few days, so after spending one night there, I pointed the car back east and drove to Yosemite National Park in the Upper Sierra Nevada Mountains. Everybody knows Yosemite National Park. If you've ever been to an Apple store or used an Apple computer, you've probably seen a photo of the magnificent El Capitan or the glacier-carved Half Dome. It is one of the most visited national parks and with good reason. What I discovered as I pulled my car into Yosemite Valley is that no photo can do this place justice. It truly is a place you have to see to fully appreciate. Yosemite National Park is full of surprises. It is a very large park, but most of the sights it's known for lie in a small region called Yosemite Valley. Here is where you'll find such formations as El Capitan, Half-Dome, and Cathedral Rocks. As you pull in, they tower over you like waves at their peak just moments from breaking. They shoot straight up for hundreds of feet and are so magnificent one can't help but wonder what cosmic or geological event took place to create such titanic formations. El Capitan as seen from Valley View pull off. Like so many other spots on this leg of the trip, I had to work around the weather. When I arrived in Yosemite, it was raining and the valley was covered in fog. One thing I hadn't anticipated was how commercialised Yosemite would feel. Yosemite is on of the most well known and most visited national parks and despite the snow and dreary weather, the park was still more crowded than I expected. Throughout the valley were numerous lodges, hotels, and convenience stores. There was a constant rotation of buses circulating through the park, transporting tourists to and from various hot spots and even driving through the campground while I tried to sleep. At times, it felt more like a theme park. By the second day, the weather had cleared up considerably, giving me the opportunity to shoot some of these iconic natural monuments. However, come nightfall the rain had returned and would continue for the entirety of the following day. As I sat in my car contemplating what to do, I checked the forecast in San Francisco and saw that the next two days had great weather on the horizon. Knowing I already had some great photos from Yosemite under my belt, I made a quick decision to leave Yosemite early and take advantage of the clear skies in San Francisco. When I arrived back in San Francisco, I was a man on a mission. I was determined to get a great shot of the Golden Gate Bridge having failed to do so the last time I was here. I've wanted a solid photo of this bridge in my portfolio for a while and was resolved not to leave until I got it. I quickly found out a great place to shoot the bridge called Marin Headlands in the Golden Gate National Recreation Area. During WWII, Marin Headlands was the sight of numerous military bunkers that you can still see and explore today although now they're mainly used as a canvas for graffiti artists. Following San Francisco, I began the journey to my favorite place in the whole country: Big Sur. I first visited Big Sur two years ago on my road trip up the California coast. In a nutshell, Big Sur is a place where the forest meets the ocean. But to me, it is so much more than that. It's hard to explain, but one can't help but feel at peace in a place like this. There is little cell phone service and it's easy to get lost in the quiet energy of the coast. Not surprisingly, it lies home to the Esalen Institute, a famous non-profit retreat center (think Mad Men finale) and the New Camildoli Hermitage Monastery where I met a monk named Tim. Having been here before, I knew I wanted to camp at Kirk Creek Campground which lies right on a cliff over the ocean. Last time I was here, I got a good spot. This time, I got the absolute best campsite on the whole grounds. I was able to pitch my tent about five feet from the edge of the cliff and every night fell asleep to the sound of the waves crashing below me. As wonderful as Big Sur was, things weren't exactly smooth sailing this time around. On my second day there, it rained non-stop from morning to night. Not only did this make shooting near impossible, but it also made the PCH too dangerous to drive on. As you looked down the road, you could actually see huge rocks falling down the hills and onto the freeway. I ended up spending almost my entire day watching movies in my car until it was time for bed. The next day the weather was better, but the PCH was closed down all day as construction crews cleared the road of fallen rocks making it impossible for me to get back to my campground until nightfall. About 40-miles north of Kirk Creek is Big Sur's most famous man-made landmark: Bixby Bridge. Since I couldn't get back to my campground, I figured this would be the perfect night to venture further out and get some great shots of it - unfortunately, this would end up coming at a price. While the rain had dissipated, the heavy winds that came with it persisted throughout the day. As I shot the Bixby Bridge, an RV pulled up behind me and the driver began to ask me a few questions about what I was doing. Suddenly, as we conversed, he shouted and I turned around to see my tripod and camera falling over having been knocked over by the wind. Keep in mind, the camera and lens probably weigh a combined 10 pounds and the tripod isn't exactly light either. I've shot in rougher and windier conditions and have never once had the camera even come close to blowing over so all I can do is chalk this up to a freak accident. But the lens took the brunt of the impact and ended up breaking in half. Good thing I got it insured before I left. On the plus side, though, the photo turned out great! Bixby Bridge in Big Sur. Last photo I ever took with my 24-70 f/2.8 lens. South of Big Sur, near San Simeon, lies Elephant Seal Beach. Now, I'm no marine biologist, but based on what I saw, I can only assume it was mating season. Hormones were raging, love was in the air, and let's just say there was a lot of elephant seal coitus going on. Bros before hoes guys, remember? I arrived in Los Angeles on the 19th, but not before grabbing a burrito from one of my favorite places in Malibu: Lily's. I was finally able to speak to my insurance company yesterday about the camera lens and it looks like I'm going to end up being in LA till early January while I wait for everything to get resolved. It'll feel weird being off the road for so long, but it will also give me a chance to see lots of old friends while I'm here. Once I get back on the road, I will resume the final leg of the trip, going through Arizona, Utah, Wyoming, and Colorado and finally back into Texas sometime in early February. Until then, Happy Festivus everyone! I apologize for the delay. I've been trying to get a blog post up every week, but sometimes it can be a bit of a challenge. Between editing photos and organizing words together in a manner that sounds intelligent these posts actually take quite some time to get up. Add in two friends flying out to see me back-to-back and my time for blogging becomes practically nonexistent. Where we last left off, I was in Montana getting ready to head north to Glacier National Park from Missoula. I arrived at the western end of the park on Thursday, November 10th. There are typically only two campgrounds open during the winter season: Apgar on the western end and St. Mary's on the eastern side. Connecting these two campgrounds is Glacier's famous "Going to the Sun" road that bisects the park over roughly 50-miles. Unfortunately, I found that due to ice and snow at high altitudes, the road was closed off about 20-miles in. This meant that it would be about a 90-mile detour to visit the other end of the park and I wouldn't be able to photograph many of the scenic overlooks and vistas I'd been hoping too. On the plus side, though, Apgar Campground turned out to be free in the offseason and the photo below is what my view from camp looked like. Not too shabby, eh? I wonder what it would cost for this view at a hotel? While the west side had the nicer campground, I preferred the landscape of the east side more. Rolling grasslands suddenly giving way to massive, snow-capped mountains more closely mirrored the Montana that existed in my head. When I arrived at St. Mary's on my second day, I was awestruck by the views, but dismayed to find out the campground was closed due to construction. While the other campground back west was extremely beautiful (and free), this meant that I would have to make the 90-mile commute every day if I wished to shoot this part of the park. Luckily, though, it's a very scenic 90-mile drive. The long commute turned out to the be the worst of my worries though. Every single day on the east side brought some of the strongest winds I've ever encountered. With the winds came dark clouds, spontaneous downpours of sleet and rain, as well as dynamic and fleeting light that would linger just long enough for you to appreciate it. All of these things combined made Glacier National Park one of the most challenging places I've ever shot. To compensate for the rough conditions I opted to shoot black and white. This helped emphasize the texture in the stormy clouds and enhance the contrast in the snow-capped peaks. Dynamic light near St. Mary's Campground. This beam of light materialized in the blink of an eye and shone down on the fields like a massive spotlight. I was driving in the opposite direction when I spotted it and, despite the rain blowing directly into my face, managed to get a few shots off before it disappeared just as quickly as it arrived. Two days into my stay at Glacier, my best friend Tyler flew in to keep me company. He's pretty cool and stuff. On Sunday (11/13), we hiked 8-miles alongside St. Mary Lake, bear-spray at the ready. Luckily, we didn't see any grizzlies, we actually didn't see much wildlife at all save for a few birds. I got the sense that the still of winter had arrived weeks ago. The trees were barren and creaked as we walked by. Many had fallen over from the wind, blocking the trail in front of us. All in all, it was a quiet, peaceful hike filled with good conversation and beautiful views, but I have to admit I'm glad I had some company. At Ferguson's Diner in Spokane. We didn't know till we got there, but a famous scene with Johnny Depp from Benny and Joon was filmed at this diner. After spending two nights in Montana, we continued westward. The plan was to spend two days driving to Seattle, after which Tyler would fly back to Houston on November 15th. We spent most of our day driving through heavy rains across Montana, Idaho, and into Spokane before arriving at Riverside State Park in the afternoon where we quickly set up camp before embarking on a casual hike through the grounds. The air was brisk and the rain had ceased, giving way to cool temperatures; a perfect night for camping. The following day was the 15th of November and I would be celebrating two-months of life on the road. However, it would also mark the 10-year anniversary of my brother, Grant, passing away, and this was weighing more heavily on my mind. Every year, I acknowledge the day in my own quiet way; but this year I had something special planned. I had in my possession a beer that traveled all the way from Belgium and was considered unanimously to be one of the best beers in the world. Called Westvleteren 12, it was a gift from my sister and brother-in-law and had been sitting in my closet for over two years just waiting for the right moment to be opened. So after two years of waiting, I made a toast to my brother and finally enjoyed a delicious bottle of Westvleteren 12 while sitting around a campfire listening to classical music with my other brother. It was a damn good evening. We eventually arrived in Seattle early in the afternoon and were greeted by heavy rain and fierce cold - you know, good ole Seattle weather. So Tyler and I drove around exploring, eating oysters, consuming bloody marys, and having a jolly old time before I dropped him off at the airport around 10pm. Twelve hours later I arrived back at the airport to pick up my friend Jordan. We left Seattle-Tacoma Airport and Jordan told me that his only request was that we spend at least one night backcountry camping. I was happy to oblige. I knew that, like Glacier National Park, certain high elevation roads and campgrounds would be closed for the season, and this would be a great chance to get some stunning mountain shots. After spending one night in the park, we drove to park headquarters to consult a ranger. He recommended a 4-mile hike up to Deer Park Campground and guaranteed us we wouldn't see a Sasquatch, much to my disappointment. After driving miles up winding mountain roads, we arrived at our trailhead and prepared to set forth. What followed was one of the most challenging hikes I've ever done. The park ranger had told us the hike would be roughly 4-miles and "slightly" uphill at times. This was a lie. What he should have said was that the hike was 6-miles and incredibly steep almost the entire way up. To say I struggled is an understatement. However, when we finally arrived at camp, all angst and frustration from the hike slid away as we were greeted with some of the most awe-inspiring views I've ever seen. As sunset arrived, waves of orange and yellow fog rolled in, making the mountains seem on fire. Took this from camp at Deer Park. Modeling and additional light provided by Jordan Long. The next day we hiked a considerably easier hike down from the mountain and made our way to one of the most popular areas in the park: the Hoh Rainforest. The Hoh Rainforest doesn't feel like it belongs in this world. Covered top-to-bottom in dense moss, the forest seems timeless, like something from Middle-Earth. Tall spruce trees tower above the ferns and banana slugs who dwell below. Even the air felt different (to me at least). One thing I hadn't anticipated was how enormous Olympic National Park was. To put it into perspective, Acadia National Park in Maine covers roughly 76.5 square miles. Olympic National Park, by comparison, spans a whopping 1,442 square miles! This was actually Jordan's second time here in the past year, and I can now understand why. After four days, I felt like I had just barely scratched the surface. So by the time I dropped him off at the airport on November 20th, I had made up my mind to stay at the park a little longer. The following day, I drove back into the park on the 101 heading west. My goal was to explore the most northwestern point in Washington: Cape Flattery. Cape Flattery was named by the famous explorer, James Cook, who discovered it in 1778. While it is a part of the Olympic Peninsula, it is not a part of Olympic National Park. It is actually located on an indian reservation belonging to the Makah tribe who have dwelled in the area for close to 4,000 years. After taking a quick selfie at Cape Flattery, I spent the rest of the afternoon scouting photo locations for sunset. But one thing I learned after almost a week here, is that the weather changes fast and what was a nice day turned into a gloomy, overcast evening spoiling my chances at getting a great photo. The forecast the following day was rain and lots of it. So I decided to conclude my time at Olympic and begin heading south. My next destination was Mt. Rainier but the rain seemed to have followed me. After two days of unsuccessfully "waiting it out" I finally gave in and drove first to Aberdeen, WA (birthplace of Kurt Cobain), and then to Astoria, Oregon (birthplace of The Goonies). At present, I'm in Portland, Oregon where I've been staying with my friend Tierra for the last two days. Sometime in the next few days, I should arrive at Crater Lake National Park in south Oregon. However, the Pacific coast holds a special place in my heart and I have since decided to take my time as I head south down the Pacific Coast Highway. Until next time, hope you guys enjoy the photos. Here's to two more months of living free on the road! I'm currently in Missoula, Montana getting ready to drive north to Glacier National Park. It's been a very busy week. Unfortunately, I fell a bit behind schedule while exploring the eastern United States. Last you heard from me, I was in Burlington, Vermont on Halloween. I have a friend flying out to camp with me in Washington next week so in order to meet with him on time, I had to make a beeline across the country. Unfortunately, this meant I didn't get to explore Chicago or the great lakes region as originally planned. However, the places I did get to explore were incredible. Lake Champlain as seen from Burlington, Vermont. I had heard many great things about Burlington, but sadly, due to the aforementioned time constraint I found myself in, I was only able to stay long enough to brave the cold and get a great shot of Lake Champlain (above). The next day, I woke up to ice on my windshield and snow lining the highway. As soon as the frost had thawed from my car I got back on the road, driving through the Adirondacks of upper New York state en route to Niagra Falls. As I neared Buffalo, I decided to cross the border into Toronto. I had heard that the best views of the falls could be found on this side (plus I'd never been to Canada). Something I wasn't expecting about Niagra Falls was just how close you could get. The shot below, though zoomed in a bit from where I'm standing, is pretty much the view from the Canadian side. Another thing I hadn't anticipated (although I should have) was the overwhelming number of tourists, and while I didn't let this stop me from shooting, I found shooting at sunrise to be a much more enjoyable and less crowded experience. After saying goodbye to dad, I got back in the car and continued west. My destination: Theodore Roosevelt National Park in North Dakota - which meant I had about 1,200 miles to cover in 48-hours...thank god for podcasts. I continued through the farmlands of Wisconsin and into Minnesota where I spent the night in my car outside of Minneapolis. This probably isn't surprising, but North Dakota is a pretty flat state. As I drove through the following day, endless farms and grasslands stretched as far as the eye could see. But as I neared the park on the western border of the state, suddenly, as if welcoming me to the west, the landscape exploded into stunning plateaus, deep canyons, and geographic formations unlike anything I'd ever seen. Teddy Roosevelt himself described the land as being, " so fantastically broken in form and so bizarre in color as to seem hardly properly to belong to this earth." Theodore Roosevelt National Park is the only national park named after a person and is also one of the least visited parks in the country. In February of 1884, while in his mid-twenties, he tragically lost both his mother and his wife just hours apart from each other. Stricken with grief, he relocated to North Dakota in the hopes that solitude with nature ease his suffering. His time spent here had a profound impact on him and led him to later form the National Forest Service as well as numerous national parks - an achievement that would later earn him the nickname, the conservationist president. I arrived the park in the late afternoon on a Friday. Due to the weekend, I was nervous that I would arrive at the campground and find it full. However, when I pulled into Cottonwood Campground, I found the exact opposite. aside from the numerous buffalo and wild horses roaming the campground, I had the whole place to myself. I took the opportunity to make sure I got a campsite with a view! Unlike most national parks, Theodore Roosevelt National Park has two units located about 50-miles apart. The south unit is the bigger of the two so I opted to spend three nights there and one night in the north unit. One thing that can't be overstated is the sheer number of wildlife that roams this park. 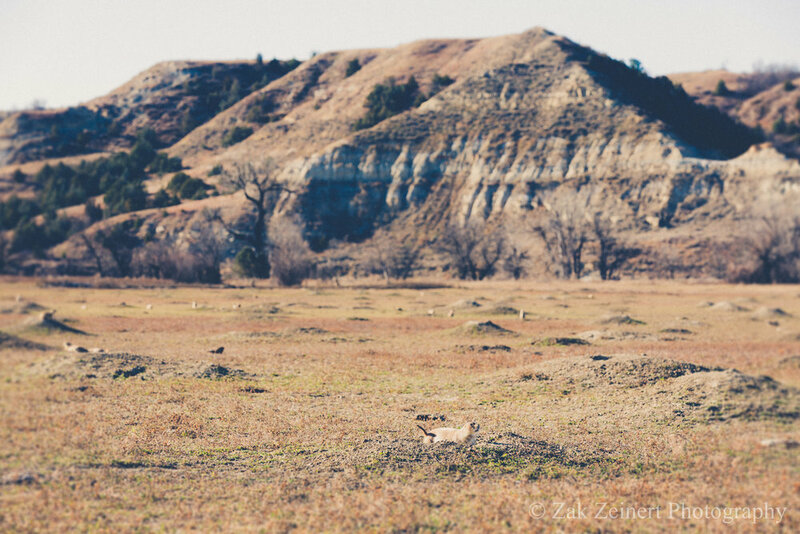 aside from the aformentioned buffalo and wild horses, the park is also home to hundreds of prairie dogs and numerous deer. One night while out shooting, I met this incredible local family who was kind enough to invite me to dinner with them and even paid for my meal. The two oldest children Nick and Sarah were insane! While out shooting they would constantly traverse up and down steep cliff faces like it was nothing. I had an incredible time at this park. While it was much less crowded than the other parks I've visited, I welcomed the change. I often found myself completely alone with nature while out shooting. It gave me a chance to really reflect on how fortunate I am to be doing this and how fortunate we are to live in a country that offers such amazing parks and landscapes. Winter is coming! It's currently about 40-degrees outside and I'm sitting in a Starbucks in Burlington, Vermont. I spent the last week exploring around Manhattan, Boston, and Acadia National Park in Maine where, despite the cold temperatures, the fall foliage was peaking with leaves of deep oranges, reds, and yellows. However, now in Vermont, those rich colors are giving way to browns and falling from the trees. I even saw snow for the first time today! Sadly, with the cold of New England, came dreary weather and I spent most of my time in New York navigating around spurts of fierce rain. To compensate for this, I turned my camera away from the skyline and onto the people and sites around me. Fortunately, by my final morning, the weather had cleared up and I was able to get a great shot of the Manhatten skyline from Brooklyn Bridge Park in Brooklyn. While in New York, I stayed with my Aunt Dawn who is a flight attendant and has lived in Manhattan for almost 30 years. Because I'm an idiot, I forgot to get a photo with her, but I did get some photos of the delicious food she treated me to at Temerario in Midtown including some sauteed grasshoppers with our guacamole. After three nights in New York, I continued north on my way to Boston where I was able to reconnect with an old friend from high school that I hadn't seen in almost a decade. Emily and husband Nate were so accommodating and let me stay with them two nights. Nate, who is studying law at Harvard even let me sit in on one of his classes. Something that's been high up on my bucket list for a while is to visit Walden Pond. Walden Pond, if you don't know, is where the existentialist writer, Henry David Thoreau, penned his memoirs about living away from modern civilization in the mid-1800's. Thoreau stated that he wished to live 'deliberately' and 'front only the essential facts of life.' I first discovered Walden when I was a teenager and Thoreau's sentiments about living purposefully without all the stifling and oftentimes absurd standards of society deeply resonated with me and helped set me on the path that led me to where I am now. After Walden Pond, I spent the rest of my afternoon strolling around Boston soaking in the historical significance of this ancient town. On Tuesday (10/25), I said goodbye to Emily and her family and began the 4-hour drive to Maine. Acadia National Park located on Mt. Desert Island is a park that I have been especially anxious to see on this trip and it lived up to my expectations in every way. From shooting the famous Bass Harbor lighthouse at sunset to falling asleep in my tent to the sound of buoy's ringing out in the harbor, Acadia National Park is probably my favorite place I've visited so far on this journey. Jordan Pond in the later afternoon. Those two hills in the center are called "The Bubbles," (For obvious reasons). On my last day in Acadia, it rained non-stop from morning till night. Obviously, I wasn't able to get many pictures because of this, but I still spent the day exploring and seeing a different side of the park. From the cliffs over the ocean, I watched as massive northeastern waves pummeled the coastline over and over; a powerful reminder of the sheer strength and ambivalence of mother nature. After Acadia, I flew home to Houston for barely more than 24-hours for a party in honor of my sister and her husband. Things got a little wild, but it was a nice change from sleeping in the cold and rain. I arrived back in Maine late last night and this morning drove to Burlington. It's Halloween too. As of today, I've officially begun my journey westward after seeing both eastern tips of the country in 45-days. I should be in Seattle in about two weeks, but before then I've got a few places to shoot.